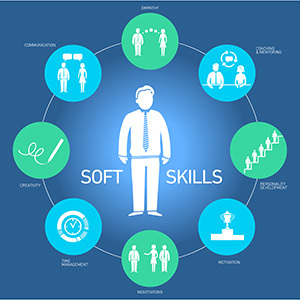 Soft skills are more important than ever when it comes to cybersecurity, according to a recent survey of IT security professionals conducted by Dimensional Research for security and compliance provider Tripwire. Seventy-two percent of respondents in the 2017 Cybersecurity Skills Gap Survey said the need for soft skills has increased over the last two years, and 21 percent went so far as to say that soft skills are more important than technical skills when hiring staff. Ability to work under pressure (58 percent). "The cybersecurity industry should not overlook the soft skills that are needed to build a strong security program," said Tim Erlin, vice president of product management and strategy at Tripwire, in a statement. "The reality is that today's security pros need to go beyond technical expertise. Security practitioners need to be good communicators who can connect cybersecurity issues to business priorities, rally the rest of the organization to get involved, solve tough problems and handle sensitive issues with integrity." "It's become increasingly apparent that security is a shared responsibility, even for those without any technical cybersecurity experience," commented Erlin. "Employees from other functions can partner with their security teams to help them look at issues from different perspectives, help further the broader organization's understanding of cybersecurity, and help enforce best security practices across the organization." For more information and an infographic on the survey findings, visit the Tripwire site.